Dad was feeling sorry for me the other day, so he bought me a present. I think it's a pretty good gift. 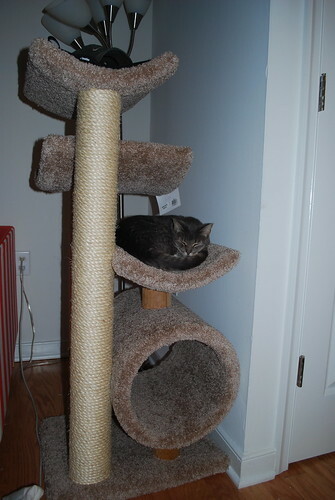 It's nice and tall, so I can really stretch out on the scratching area and it has several levels, so I can sleep low or high. The only problem is that my dad has decided to claim the top level for his hat and other stupid human accessories. 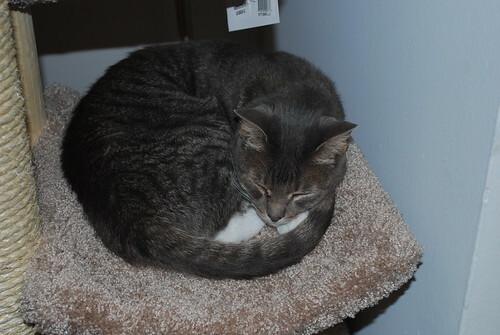 Still, it's pretty comfy for sleeping. I think it's a good sign that I can give my dad certain looks and get him to go buy me stuff. What do you think I should get him to buy me next? A pet goldfish? A pet bird?